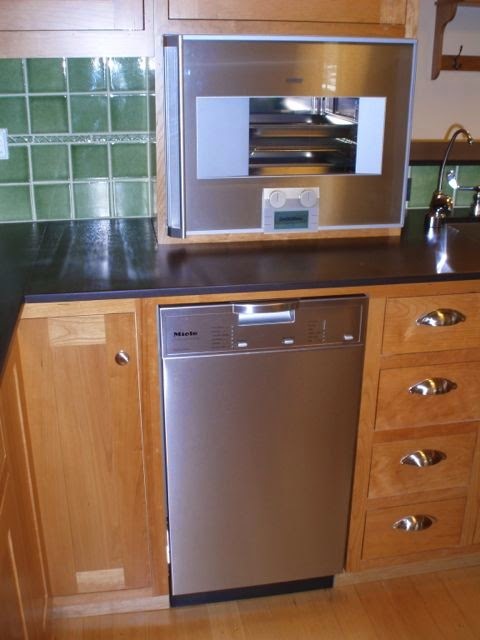 In this post I will share the water efficiency features we have at Midori Haus. The features are organized into 3 categories: easy, moderate, and advanced. The items in the easy category can be done for a low cost without specialized skills such as changing the shower head. The moderate items cost a little bit more and unless you have the skills yourself, you’ll likely need to hire someone who knows what they’re doing. For example changing out your toilet. 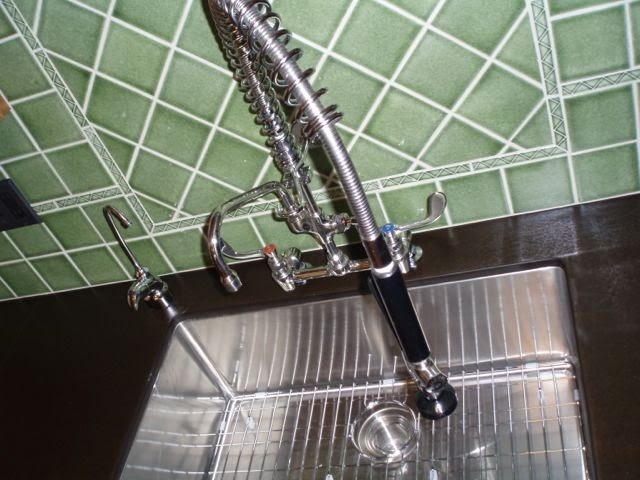 The advanced items require permit and competence in plumbing and you’ll need to hire a plumber. Sheet mulching is a great way to manage rainwater oudoors. 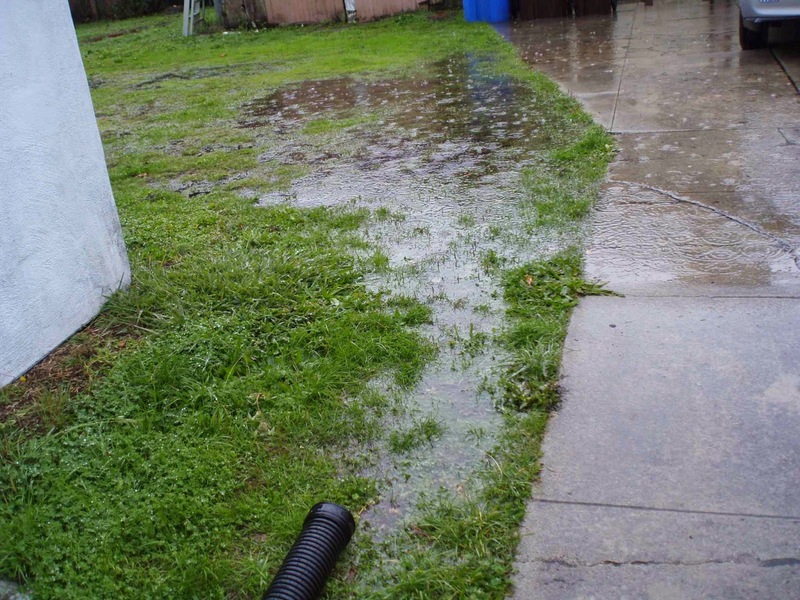 It’s good for both water conservation (no need to water the lawn) and for water onsite recharge (rather than sending the rainwater down the storm drain). Sheet mulching is easy. First you harvest a bunch of large, sturdy cardboards from the recycling bins of stores that sell large stuff like bicycles, appliances, lawn mowers, etc. Be sure to ask them first. Even if it’s a waste product they’re dumping in the recycling bin the stores appreciate you for asking their permission to take the cardboards. 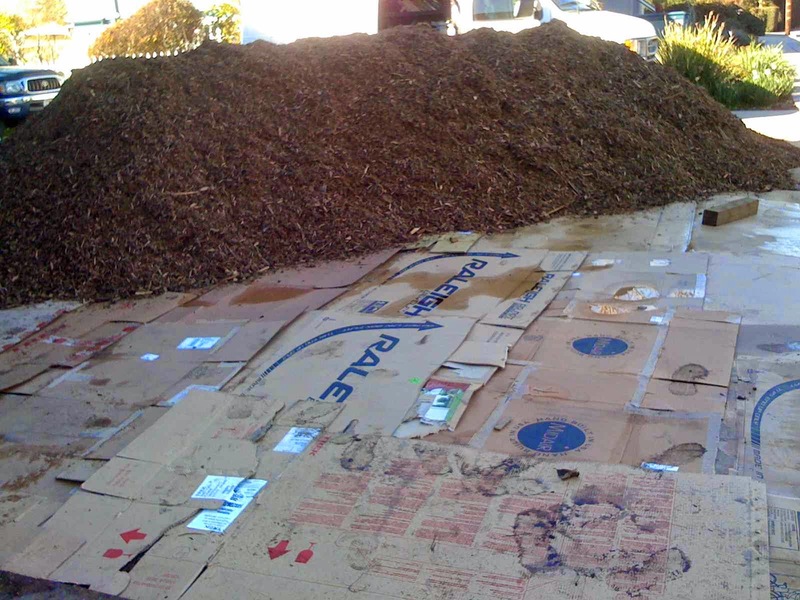 Once you’ve hauled the cardboards to your property (you may need to make several trips) you lay them down in the yard, overlapping the edges by 6-8 inches to block the weeds from sprouting, and spread wood chips or mulch over them. We got our mulch from Vision Recycling. Our primary purpose for sheet mulching was to have a low maintenance yard while we figured out what to do with landscaping. Some folks test the soil then apply compost and soil amendment before laying down cardboard to make the soil suitable for the intended plants. Since we didn’t know specific plants to be placed in what spot and we needed to cover a large area (about 4,000 sqft) we didn’t bother with applying compost below the cardboard. The only thing we paid attention to was the removal of all packing tape and staples from the cardboard boxes. This we learned years ago when we did sheet mulching at another property. The packing tapes adhered to the cardboards lasted much longer than the cardboard itself and and over time we ended up picking up strips of plastic tape in the mulch when the carboard degraded. It looks a bit trashy and ugly at that point so best to eliminate them before placing the cardboard down. Heads-up: If you plan to do sheet mulching be sure to check with your local water department for rebate availability. We didn’t qualify for the rebate from our local water department because the criteria was removal of active water sprinklers. Since the sprinklers and pipes we dug up were not used for several years we did not get a rebate. 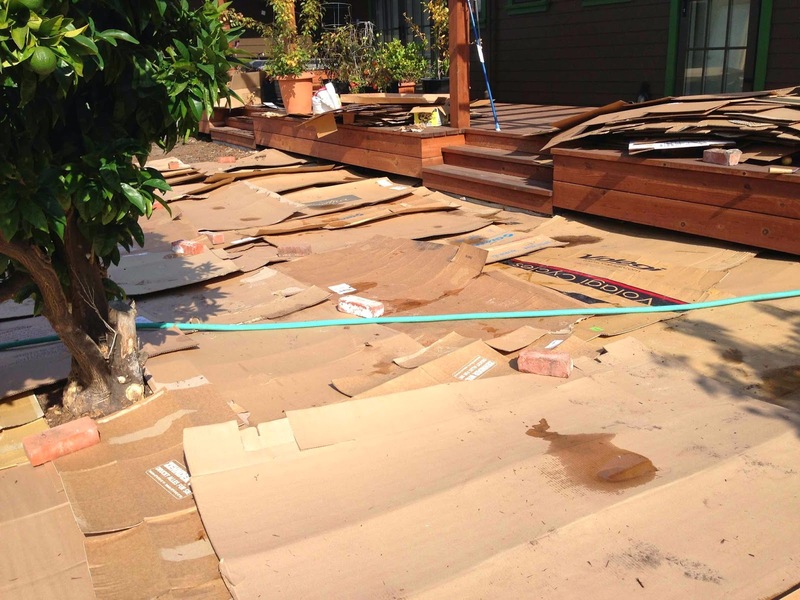 My friend in San Bruno recently completed sheet mulching of her yard but found out too late about the rebate. The water department in her area offers rebate for sheet mulching but you have to apply for it before you begin your project. Each water district offers different incentives so check with them before you embark on water saving projects at your home. Sheet mulching is beneficial in many ways. The obvious one is to eliminate the need to water a lawn. In our case the unmanicured grass in the yard was plain ugly so we were happy to not water them and cover it up. The second benefit is to avoid flooding during heavy rain because the mulch soaks up the rainwater. In the winter a section in the backyard near the garage would flood and made it difficult to get into the garage. This problem went away with sheet mulching. The third benefit is to keeping our shoes clean during the rain. With heavy clay soil around our property walking on wet soil after rain resulted in having an inch of mud caked on to the bottom of our shoes. And finally, the mulch keeps the soil underneath moist and happy. Our orange tree seems to be doing a lot better after sheet mulching. Here are some photos of before, during and after sheet mulching. Before: Backyard near the garage would flood during heavy rain. 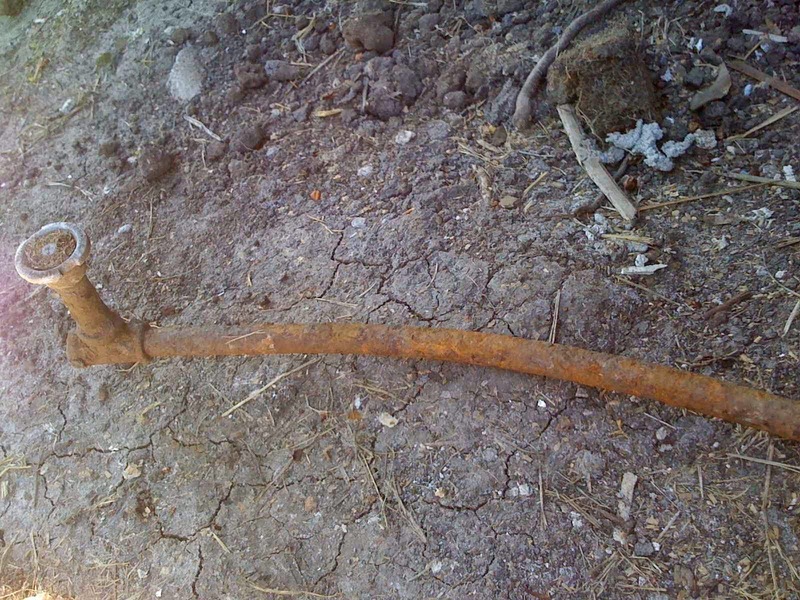 Before: Although we dug up old sprinkler remains we weren’t eligible for a rebate from the water department. Food for thought: Did you know that the volume of water used outdoors versus indoors vary quite a bit within California? In the interactive graph in this KQED blog you’ll see the average household water use in California broken down by indoor and outdoor use. The average use for the state of California is 53% outdoors and 47% indoors. In northern California, where we are, the ratio is reversed where 42% (125 gallons/day) is for outdoor and 58% (171 gallons/day) is for indoor. Then there are further variation by water districts. For example, when you look at a coastal city like Santa Cruz the residents have low average use of 95 gallons per day and the portion for outdoor use is small. If you’re interested in further detail of the water use by Santa Cruz residents the Water Use Baseline Survey will provide you with interesting data such as 50% of single family homes have no turf (figure 13 page 26). Replacing the showerhead is easy. Plumbing code requires showerheads to be 2.5 gallons per minute (GPM) or less and we all can do better than that. We came across the Niagara line of products at the exhibitor booth at a water conservation conference we attended. 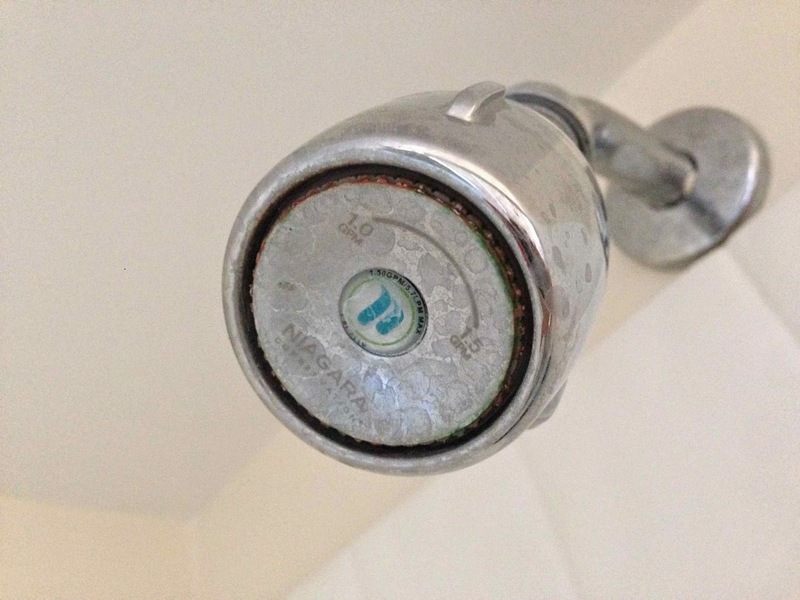 Here is a photo of our well-used, hard-water-stained showerhead made by Niagara. Niagara Bi-Max Showerhead can be set for 1 gallon per minute or 1.5 gallons per minute. We have it set at 1 GPM and the it feels nice. The water that hits your body is a combination of a raindrop and a fine mist and it’s surprisingly satisfying. Here’s another product from Niagara to reduce water flow. 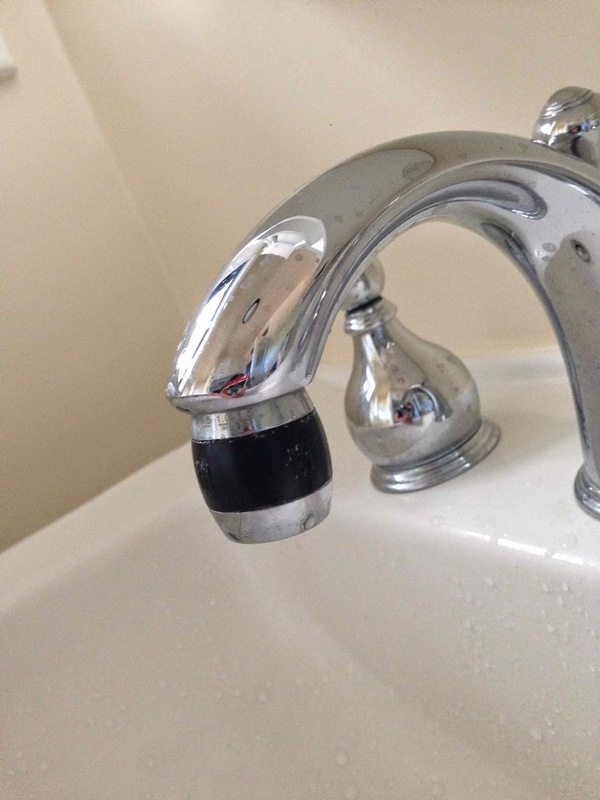 This aerator attached to the bathroom faucet and we usually have it set to the low flow setting for handwashing. I use the higher flow rate if I’m filling a vase or a small bucket. Niagara Tri-Max Aerator has 3 settings: 0.5 gallons per minute, 1.0 gallons per minute, and 1.5 gallons per minute. Grinding food scraps in the garbage disposal requires both electricity and water. And you may be inclined to use lots of water to make sure the food scraps move along in the waste water pipe to prevent clogging. But what if you didn’t send the food scraps down the sink in the first place? It’s just as easy to trap the carrot peels and food scraps in the wire mesh and throw it into the trash can. Or placing the food scraps in the compost bin is even better. We didn’t install garbage disposal under the sink becase we didn’t want the noise and we also wanted to save both water and electricity. We’ve been living in Midori Haus for 18 months and I’m happy to report that we have had no problems with the food scraps clogging our pipes. 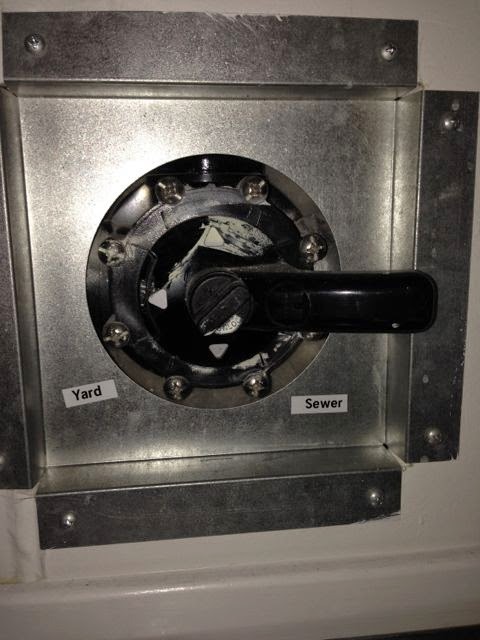 We have double containment in our kitchen sink to prevent large food particles from getting into the wastewater pipe. It doesn’t take much effort to empty out the strainers regularly. 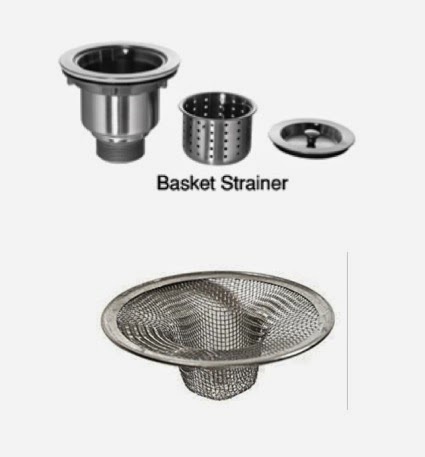 The basket strainer came with the sink and we got the mesh strainer at local hardware store. If you have a garbage disposal in your kitchen sink today you can simply choose to stop using them. Super simple, right? But I realize that some folks are really passionate about their garbage disposal. In the introduction section of the book, On The Grid, Scott Hueler shares a colorful narrative of his city’s (Raleigh, North Carolina) attempt to ban the garbage disposal during a drought. Food for thought: Have you ever taken a tour of the sewage treatment plant? I’ve been to waste water treatment plants in Santa Cruz and Palo Alto and have taken a guided tour of the facilities. Yes, it’s stinky. It’s also quite fascinating. One of the first things they do at sewage treatment plant is to scoop out solid materials to be hauled off to a landfill. This made me think about how my personal actions affect downstream processing at the wastewater treatment plant. By grinding your food scraps in the garbage disposal and sending it down the sewer you’re just giving the waste water treatment plant more stuff to process. I should mention too that in my monthly utility bill that combines water, garbage, and sewer services the sewer component is the most expensive. 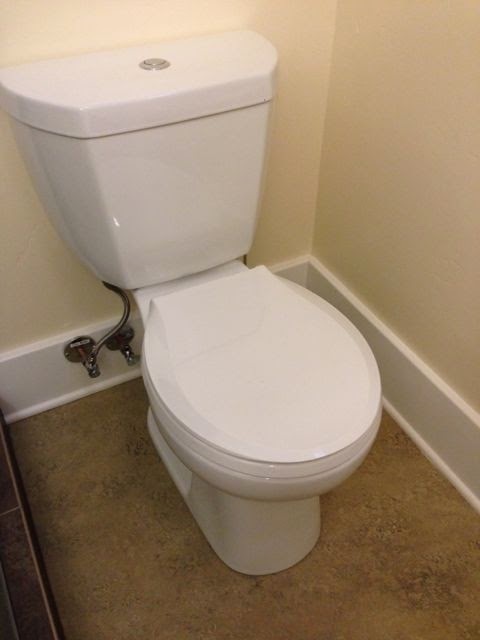 Most homes have 1.6 gallons per flush toilets. These are much better than the older toilets but if you want to do better you can install a dual flush toilet (2 different buttons — one for liquid waste and another for solid waste). Or you can simply install a 0.8 GPF Niagara Stealth toilet like we did. We have two of these toilets and they work well. Look for rebates in your area for replacing your older toilet that used more than 1.6 gallons per flush with high efficiency toilets. Here’s an example of a high efficiency toilet rebate in San Francisco. A small dishwasher uses less water than a large one. For just the two of us this Futura Slimline Series dishwasher from Miele works really well. It’s less than 18-inches wide but it fits dishes for 10 place settings. It uses only 6 gallons per cycle. 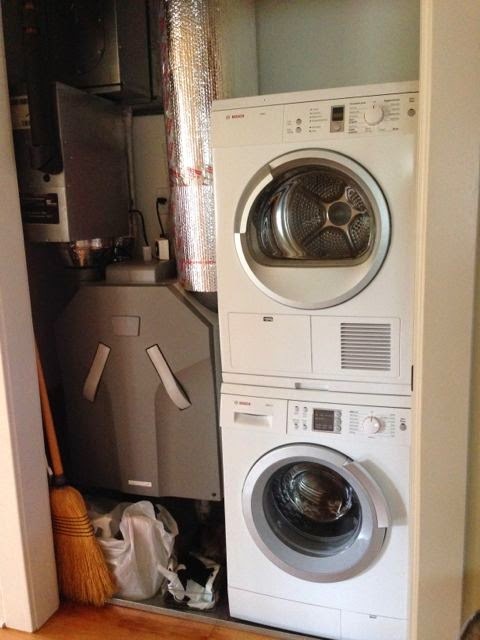 For clothes washer we chose the 24″ Bosch Axxis Plus model that uses very little water. The manufacturer’s spec sheet says 3,904 gallons per year. In general the front loading washers use 1/3 less water and detergent than the top loading ones. The commercial pre-rinse assembly and faucet from Fisher delivers 1.15 GPM at 60 PSI. It removes food from pots and pan pretty well using very little water. We decided to use a commercial assembly rather than a residential kitchen faucet because it’s cheaper than the fancy residential models, works better, and the replacement parts will be available for a long time. It doesn’t look bad either. The wastewater pipe from our washing machine is connected to diverter valve that can direct the laundry wastewater from the washing machine to the landscape. Right now the diverter valve is set to flow the laundry wastewater to the sewer. Why? Well, we don’t have our garden planted with all the fruit trees we want yet. Our orange and apples trees are very mature and the roots are probably tapped into some water source. We’ve planted lemon, plum, and pear trees a few months ago and will likely plant other fruit trees. Once all the trees are planted we’ll lay out the irrigation pipes to direct the laundry water to the roots of the fruit trees. I wrote about laundry to landscape when I took a workshop with LeAnne Ravinale in October 2011 showing details of an installation at another house in Santa Cruz. You can find the post here. While Laundry to Landscape can be done without pulling a permit in California you need to follow some guidelines. By the way, you need to be careful about the type of laundry soap you use when you start watering your garden with your laundry wastewater. There is a list of ingredients to avoid and you can carefully read the label of the the laundry soap at the supermarket. But it’s much easier to refer to a list of safe products and shop from the safe list. We have a very water efficient front loading washing machine so the amount of laundry water irrigating the landscape will be about 50-80 gallons per week for doing 6-8 loads of laundry. If you have an older top loading washer you can direct a lot more laundry wastewater to water your garden! “What do you do between the time you turn on your shower and the time you get in?” was the question asked in the hot water heating class at PG&E. The guy sitting next to me said he would go to the kitchen and make coffee and come back in 5 minutes because that’s how long it took for the hot water to come from the water heater to the shower. Other people had various routines they would do while waiting for the shower to get warm. When I told the instructor I didn’t have a routine he asked me, “So you just turn on your shower and get in?” to which I replied, “Yes, the hot water heater is next to the shower.” I took this class several years ago from Gary Klein who works in the area of water-energy nexus. He has an interesting presentation on the topic of residential hot water distribution systems and advocated the use of structured plumbing where quick hot water would be available to every fixture with no greater energy consumption, with the target of no more than one cup of water is wasted while waiting for hot water. The cold water flowing from the showerhead down into the drain represents the water that was sitting in the pipe between the hot water heater and the showerhead. The longer the distance between the hot water heater and the shower the more water wasted. The fatter the diameter of the pipe the more water wasted. (On page 25 of Gary’s paper you’ll see the chart that represents the various lengths of the pipe that holds 1 cup of water for different diameter pipes.) For example, the length of a 3/4-inch diameter pipe holding one cup of water is 2.5 feet long. The length of a 3/8-inch diameter pipe holding one cup of water is 8 feet long. So, thinner pipes means less water wasted. In the case of the the guy in class who made coffee while waiting for his shower to get warm he had a fat pipe that ran a long distance. I imagine some of you put a bucket in the shower to collect the cold water while waiting for the shower to get warm then use the water in the bucket to water the plants in the garden — if you do bravo! But not everyone is that conscientious and sometimes you forget. So, if you have the opportunity to replace your distribution plumbing in your house go for the thinner pipes which reduces water waste. Since we replaced all the walls and the plumbing infrastructure was ripe for replacement we chose to go with thinner pipes. 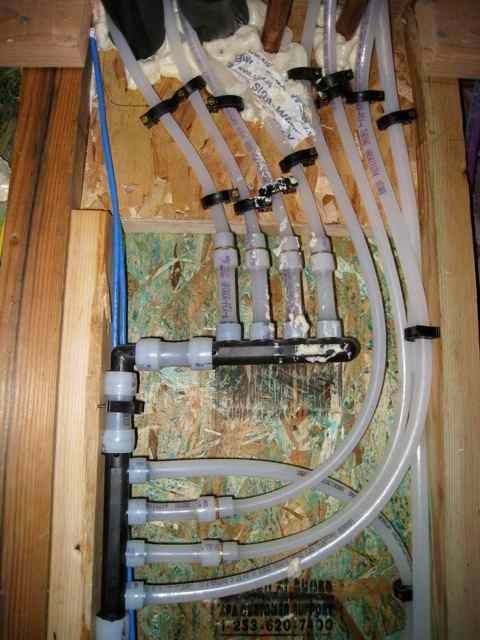 At Midori Haus we have cross linked polyethylene PEX tubes conveying cold and hot water through the house. 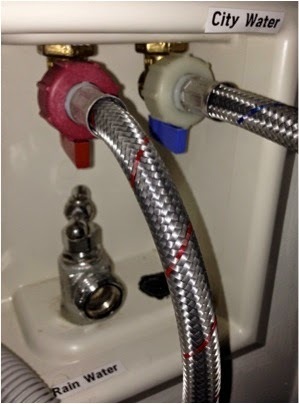 These tubes, fast becoming the standard in residential plumbing, have several benefits. These include flexibility that enables routing to avoid cutting and splicing, easier installation, lower cost, and more. See this link for other benefits of PEX. To minimize the volume of hot water sitting in the distribution pipes we used 3/8-inch PEX line between the hot water heater and fixtures. The cold water line coming into the house to the hot water heater is a larger 3/4-inch PEX pipe. 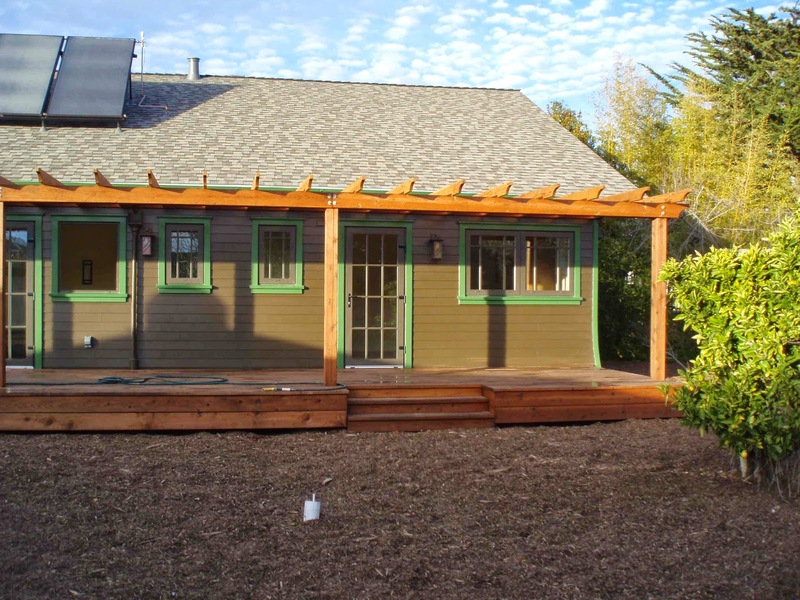 I’ve watched our general contractor, Taylor Darling of Santa Cruz Green Builders install PEX and make various connections and it seemed straight forward. 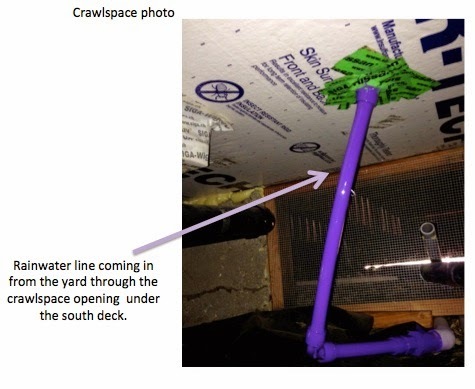 There are concerns about the chemicals leaching from PEX. The type of material we used (ASTM F2023 standard) has a 25 year assurance. We filter our drinking water at the kitchen sink. If you are concerned about this I invite you to visit this site and made a decision for yourself. 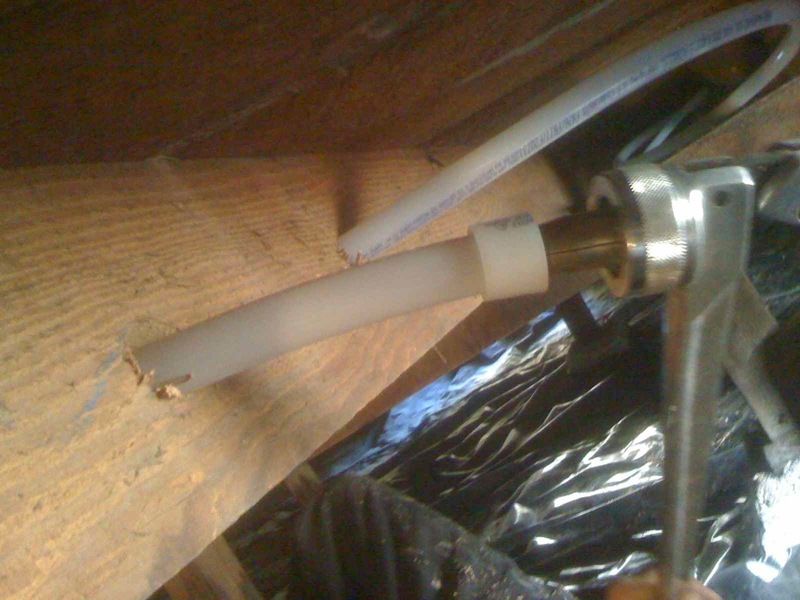 Here are some photos of the PEX lines taken during installation. 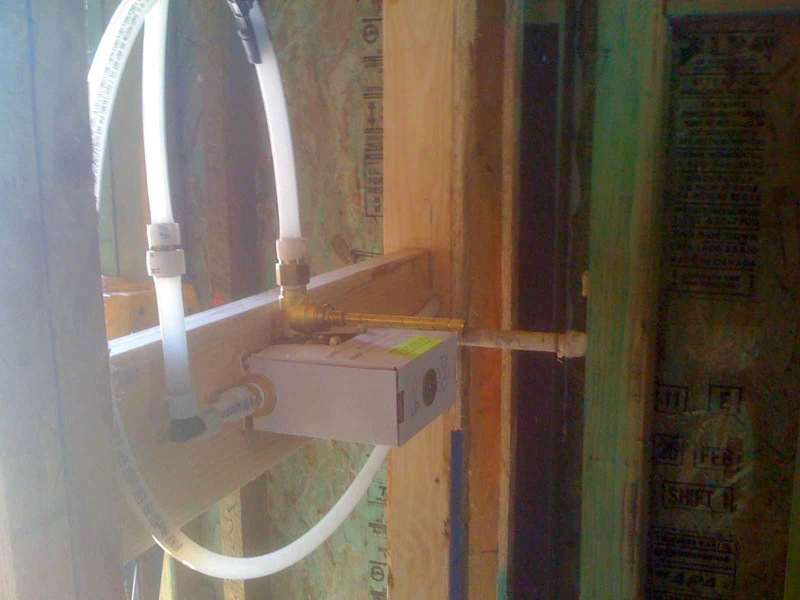 To further minimize the heat loss of the hot water sitting in pipe the 3/8-inch hot water PEX lines are insulated using Therma Cell which has an R-value of 5.8. Food for thought: Another way to minimize hot water waste at the faucet or the shower is to use a recirculating pump in the hot water line. This can be installed using a timer that circulates hot water on a programmable schedule or have it operate manually by pressing a button. We decided not to use a recirculating pump at Midori Haus because our hot water lines to the showers are relatively short and we didn’t want to use electricity for this purpose. Many people collect rainwater from the roof of their house and store them in a tank for watering their garden. This is not difficult and many people take this on a s a DIY project by referring to online resources or by attending community workshops. American Rainwater Catchment Systems Association (ARCSA) is a good resource for workshops and webinars on rainwater harvesting. A more complex use of rainwater is to put indoor plumbing in place to for non-drinking purposes. 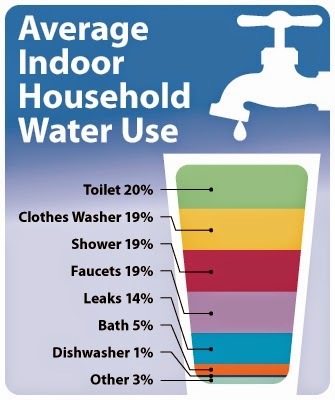 Toilet flushing and laundry are the two large components of indoor residential water use according to this diagram from East Bay Municipal Utility District. If we replace the water used used for toilet flushing and clothes washing with rainwater we can reduce the demand on our local water utility. We knew we wanted to use rainwater for toilet flushing laundry. But 3 years ago when we were in the midst of designing the details of Midori Haus we had a difficult time finding a resource to design and install a rainwater system for toilet flushing and laundry for a reasonable cost. Back then this was not part of the plumbing code so the specialist that designed and installed these systems had to go through a cumbersome process to get the system approved for a permit to satisfy the building department and the health department. People who had such systems installed spent around $30,000 and that was too much for us. 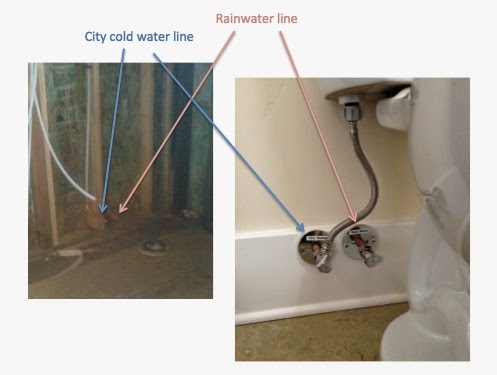 So, in anticipation of having the rainwater for toilet flushing and laundry implemented in a future stage we had the toilets and washer dual plumbed — one line for city water and another line for rainwater. This will allow us to simply unscrew the hose that connects the toilet (or the washer) to the city water line and connect it with the rainwater line when the system is available. There is no cross connection in this approach — the rainwater and city water never mixes. Here are some photos of the internal plumbing. Note: There is a difference between rainwater and gray water. Gray water is re-using the water from your sink, shower, and washing machine by making changes in the sewer plumbing so that you can direct the waste water to your landscape or to the sewer. Rainwater is harvesting the rain water that falls on your property and using them for irrigating your landscape or using them for non-potable use indoors. Exterior details of the rainwater harvesting system installed by AquaSoleil will be covered in the next post.